Of the five nominees for Best Documentary Feature at this year's Oscars, the one that seemed to be the least known and least buzzed about was Scott Hamilton Kennedy's The Garden (Oscilloscope, 4.24). It's also, after the high profile Man on Wire, Encounters at the End of the World, Trouble the Water, and The Betrayal (Nerakhoon), the last to be released theatrically in the US. But that doesn't mean it's not every bit as deserving as the other nominees. 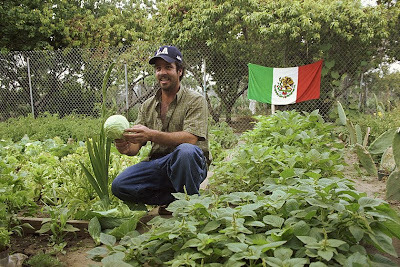 The Garden is a riveting, timely look at a 14 acre inner city garden in South Central Los Angeles, that has been tended to by the Hispanic community ever since the garden's creation in the wake of the Rodney King riots, and the legal battle that ensued after the city re-sold the land to its previous owner in a shady back room deal, potentially throwing the gardeners out forever. I won't be able to review the film until its NC release, but it will be released theatrically by Oscilloscope on April 24, and will be showing at the River Run International Film Festival in Winston-Salem on April 24 and 26. I wonder if our good friend Dan Getahun has seen this, as he is a documentary afficionado. In any case, again, it does sound interesting, and despite our aversion to the nomination process for docs, it's designation does say something. It's possible. The film is playing the festival circuit right now, not sure where it's been.